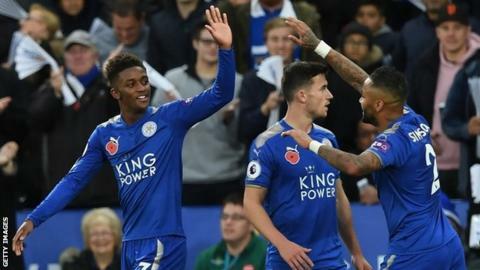 Leicester winger Demarai Gray has signed a new four-year contract with the club. The 21-year-old was close to a new deal - according to then-manager Craig Shakespeare - six weeks ago. Gray scored his first league goal in over a year in Claude Puel's first game as boss, Sunday's 2-0 win over Everton. "As a whole, we're a good group and we have a good dressing room. Now I want to get my head down and keep kicking on for the team," said Gray. "I'm very happy. I want to be starting games and, for me to be doing that, I have to work hard in training. "For me personally, it's now about developing as a player and the rest will take care of itself." Gray joined the Foxes from Birmingham for £3.7m in January 2016 and was part of the 2015-16 Premier League-winning squad. However, he has only made 12 starts in 20 months for the former champions, coming on as a substitute 39 times. Leicester rejected bids from Bournemouth and Crystal Palace for the England Under-21 international, who was part of the squad that reached the European Championship semi-finals.